Features robotic welding for greater strength and consistency. Includes large 8" x 14" nose plate with Super Slikâ¢ raised runners to help slide load on and off with minimal effort. D-Lock axle flattened on one side so it cannot rotate and cause wear. Back lip on nose plate adds strength while holding small loads in place. Curved crossbars hold load in place. Extra long stair climbers provide added frame strength and ease loads over stairs and curbs. Rugged ball bearing wheels for longer wear. 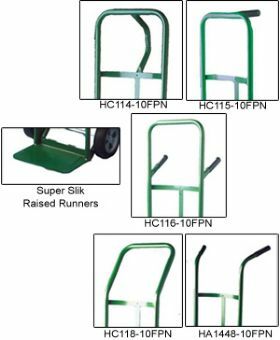 Hand trucks with semi-pneumatic wheels are available for the same price -- please specify. Green epoxy powder coated for a longer lasting finish. FOB Shipping Point. Product No. Description Cap. (lbs.) Hgt. Wheel Wt. (lbs.) Price Ea.